Between 1995 and 2010 the Honda Factory team has claimed, along with Repsol, eight premier-class world titles, 90 wins and with the second place achieved by Andrea Dovizioso at Motegi on Sunday, 250 podiums. The Repsol Honda rider left the Clínica Dexeus in Barcelona this morning (Monday October 4th) following his successful collarbone operation on Saturday. The San Carlo Honda Gresini rookie equalled his best premier class result to date by finishing sixth in the Grand Prix of Japan. The Interwetten Honda MotoGP rider equalled his best premier class result to date with tenth in the Grand Prix of Japan, as he continued to feel improvements in his physical condition. Following ninth place in the Grand Prix of Japan the LCR Honda rider said he can feel himself returning “to my level”. Rizla Suzuki MotoGP racers Álvaro Bautista and Loris Capirossi had very different ends to the Japanese Grand Prix at Motegi as one took a fine seventh position, while the other was forced to retire. The Cardion ab Motoracing rider, who will graduate to the premier class next season, scored his first World Championship podium in the Moto2 race at Motegi on Sunday. Dani Pedrosa says he is extremely unlikely to be able to race in Malaysia this weekend, leaving Jorge Lorenzo just needing a handful of points to become world champion at Sepang. Andrea Dovizioso heads to the Malaysian Grand Prix full of confidence and ready to keep the Honda name up in lights despite its championship challenge fading since Dani Pedrosa's crash at Motagi last weekend. Malaysia has been a permanent fixture on the MotoGP World Championship calendar since 1991. Take a look back at some of the most memorable and defining races with motogp.com. The first-ever Moto2 World Championship crown could be claimed by Toni Elías in Sepang this weekend as the Gresini Racing rider sets his sights on what would be his first title. The injured Dani Pedrosa has ruled out attempting to compete in this weekend's Malaysian Grand Prix, and will wait until Australia before trying to ride again. Valentino Rossi says he has no regrets about his aggressive battle with Yamaha team-mate Jorge Lorenzo in the Japanese Grand Prix, and believes Lorenzo only criticised his riding because he was frustrated at being beaten. Jorge Lorenzo says he has not yet decided whether to take a cautious approach to this weekend's Malaysian Grand Prix, knowing that all he needs is a ninth place to wrap up his first MotoGP title. Valentino Rossi will not decide whether to halt his 2010 season early to receive shoulder surgery until he has evaluated how his injury feels during the Australian Grand Prix next weekend. Andrea Dovizioso says he is now much more relaxed about his 2011 situation, and will definitely remain in the Honda fold - although he still does not know for certain which team he will actually ride for. The Red Bull Ajo Motorsport rider led the timesheet in the first 125cc practice session at the Shell Advance Malaysian Motorcycle Grand Prix on Friday. The JiR Moto2 rider was fastest in the Moto2 FP1 session as a passing storm affected the amount of time spent on track by the riders. Scott Redding, Championship leader Toni Elías and Julián Simón followed in the order. Valentino Rossi was quickest in practice on the opening day of the Malaysian Grand Prix weekend, ahead of Andrea Dovizioso and Jorge Lorenzo. Ducati team-mates Casey Stoner and Nicky Hayden both ended Friday practice at Sepang in a frustrated mood, having been unable to match the pacesetters. Suzuki boss Paul Denning praised Alvaro Bautista's practice performance at Sepang, as the Spanish rookie responded to his team's urge for him to get up to speed quicker on grand prix weekends. The Red Bull Ajo Motorsport rider led the timesheet in the second 125cc practice session for the Shell Advance Malaysian Motorcycle Grand Prix, ahead of Nico Terol and Pol Espargaró. Jorge Lorenzo was fastest in final practice at Sepang, ahead of the race that could see him crowned MotoGP world champion for the first time. Loris Capirossi has been given the all-clear to compete in Malaysian Grand Prix qualifying after his crash at the start of practice this morning. The JiR Moto2 rider was once more the fastest rider in practice as he topped the second session ahead of Simón, Corsi and Elías. 125cc championship leader Marc Marquez claimed a record 10th pole position of the season with another superb performance in Sepang qualifying. Julian Simon put himself in a good position to keep his title hopes alive by claiming his second straight pole position in Moto2 qualifying at Sepang, although points leader Toni Elias was still on the front row in fourth. Jorge Lorenzo put himself in the perfect position to clinch the MotoGP world championship by taking pole for the Malaysian Grand Prix. Nicky Hayden admitted he surprised himself by taking second on the grid at Sepang after struggling to even get into the top 10 in practice. Jorge Lorenzo said he was determined to show his speed by taking pole position at Sepang, as he does not expect to challenge for the win in tomorrow's Malaysian Grand Prix. Andrea Dovizioso has promised to be even faster in tomorrow's Malaysian Grand Prix than he was at Motegi a week ago, having taken third on the grid at Sepang. Valentino Rossi blamed a lack of pace on the softer tyre after missing out on a front row slot in Malaysian Grand Prix qualifying. Casey Stoner expects to make progress through the field in the Malaysian Grand Prix after only qualifying fifth. Valentino Rossi's long-time crew chief Jeremy Burgess looks set to join the Italian rider in moving from Yamaha to Ducati. Suzuki team boss Paul Denning described Loris Capirossi's ninth place on the Sepang grid as a 'heroic' achievement following the veteran's practice crash. :o .. Hayden in P3 ?.. good for him..
Marc Marquez reclaimed the 125cc championship lead with another unstoppable performance as he took his eighth victory of the season in Malaysia. Roby Rolfo withstood immense pressure from fellow Italian Alex de Angelis to win a cracking Malaysian Moto2 Grand Prix and in the process score his first world championship victory since Jerez 2004. Valentino Rossi charged back from a poor start at Sepang to take his first race win since returning following his injury lay-off, as his Yamaha team-mate Jorge Lorenzo superseded the Italian legend as world champion by taking third behind Andrea Dovizioso. 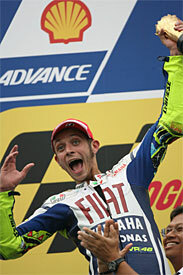 Rossi won :o ... how ??.. anyway.. so Lorenzo is our new champion ... good.. now he can enjoy rest of the races..
stoner DNF :S ... not good. Jorge Lorenzo said he was amazed that he was able to focus enough to stay with the lead fight as he reached the pinnacle of his career by becoming MotoGP world champion at Sepang. Valentino Rossi described his return to the top step of the MotoGP podium as a huge satisfaction after ending a six-month victory drought at Sepang. Andrea Dovizioso said he was not too disappointed to miss out on victory for a second successive week in today's Malaysian Grand Prix, as he felt his close second place still proved how much progress he has made recently. Here are few pics showing the New World MotoGP Champion Jorge Lorenzo and Malaysian GP winner Rossi, Moto2 Champion Toni Elias. Casey Stoner blamed cold tyres for his first lap exit from the Malaysian Grand Prix - a mistake he was certain cost him a great shot at victory. Dani Pedrosa will return to MotoGP for this weekend's Australian Grand Prix, just a fortnight after breaking his collarbone at Motegi. I was quite :o when you say it was Rossi's 46th victory but when I read on MotoGP.com that it was his 46th victory for Yamaha then I understand what you are saying. Valentino Rossi has admitted it is unlikely he will switch to formula one in the future. Now 31, the multiple champion of MotoGP has in the past flirted with a move to F1 after several test drives. After badly breaking his leg earlier this season, Rossi has been beaten to the 2010 title and it had been said his move from Yamaha to the Italian marque Ducati could be a precursor to a future move to Ferrari. But while in Malaysia last weekend for the latest MotoGP race, he told Italian media: "Now, I really don't think it (moving to F1) will happen." Rossi was also scathing whilst criticising the motorcycle racing series' governing body for deciding to delay the Sepang race to avoid a television clash with F1 in Japan. He said the move compromised riders' safety because the threat of rain in Malaysia is greater later in the day. "We always bend over backwards to the formula one superpower," said the Italian.